In 1967, Dr. Martin Luther King, Jr., isolated himself from the demands of the civil rights movement, rented a house in Jamaica with no telephone, and labored over his final manuscript. 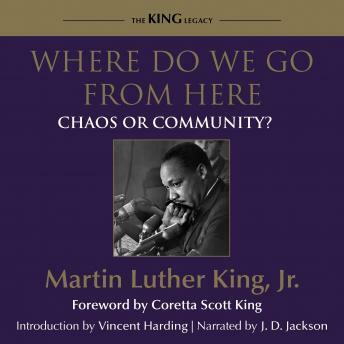 In this significantly prophetic work, which has been unavailable for more than ten years, we find King’s acute analysis of American race relations and the state of the movement after a decade of civil rights efforts. Here he lays out his thoughts, plans, and dreams for America’s future, including the need for better jobs, higher wages, decent housing, and quality education. With a universal message of hope that continues to resonate, King demanded an end to global suffering, powerfully asserting that humankind—for the first time—has the resources and technology to eradicate poverty.